Enjoy This Hotel's Service in Tulsa, OK Medical DistrictWhen you stay at this nonsmoking hotel's property in Tulsa, OK, the entire city opens up for you. 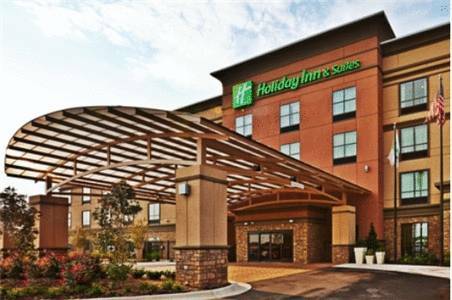 The Holiday Inn Hotel & Suites Tulsa South is located just off Hwy 169/64, making it easy for patrons to get to all the local businesses and attractions.There is so much to do while staying in Tulsa, OK. The hotel's location makes it easy to get to the Woodland Hills Mall for a variety of great shopping deals. The Tulsa Zoo brings exotic animals from around the globe together in the beautiful surroundings of Mohawk Park. Nearby is the Tulsa Air & Space Museum, as well.Does business bring you to Tulsa? Relax, our great amenities and staff help make your stay comfortable and efficient. Check your email from the 24-hour Business Center using free Wi-Fi access. The 1,650-sq-ft meeting room can accommodate up to 125 guests. The Cancer Treatment Center of America, St. Francis Hospital, Southcrest Hospital and AT&T are all near this hotel's Tulsa, OK location.This hotel's pet-friendly accommodations and experienced staff strive to make you feel completely pampered. After a long day, you can swim a few laps in the indoor, saline pool or relax in the whirlpool. The Suite Shop offers all the snacks you crave. For more substantial fare, feast on contemporary American cuisine at The Red Fork, located off the lobby. We look forward to making your next stay with us both memorable and relaxing. Red Fork: American Cuisine cooked fresh daily. The Tulsey Ballroom: The beautifully-appointed Tulsey Ballroom features 1,260 sq-ft of space with state-of-the-art audio visual equipment and sleek pre-function space for friends, family or colleagues to gather. The BuckleAt Buckle.com, shop designer jeans and clothing from your favorite brands including BKE, Affliction, Rock Revival, Miss Me, Big Star and more. Lane BryantThe latest looks in women's plus size clothing are just a click away at Lane Bryant. Shop trendy tops, pants, stylish dresses & more in sizes 14 to 28. Battle Creek Golf ClubBattle Creek Golf Club is located 10 minutes east of the hotel in beautiful Broken Arrow. It offers a first class golf experience. Jenks AquariumLocated in Jenks on the Arkansas river. Offers over 200 marine and aquatic animal exhibits, plus a fishing tackle museum.